This year we have a PACCSA team for the national bike challenge! If you ride a bike during the summer, please join the team. Log your miles and watch your place on the PACCSA leaderboard and the team's place on the national team leaderboard. It's all in fun, and if you pass through Pittsburgh you can stop in at OTB cafe and pick up a free beer, thanks to their pedal for pints program, if you've earned one (the first one is easy). 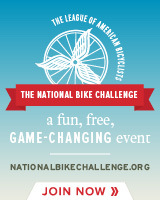 You'll need to create an account on nationalbikechallenge.org, but if you already log your exercise using endomondo or mapmyrun, the bike challenge site can sync with those automatically.